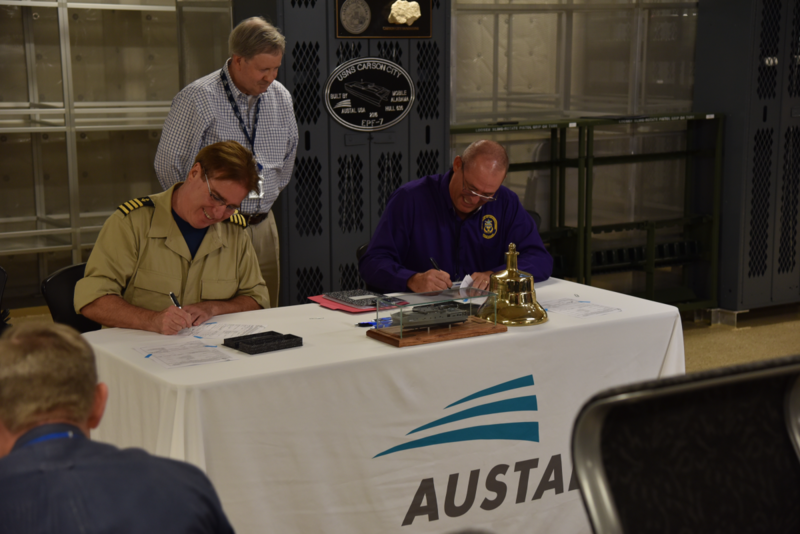 Austal Limited (Austal) (ASX:ASB) is pleased to announce the U.S. Navy has accepted delivery of USNS Carson City (EPF 7) from Austal USA, during a ceremony held aboard the ship at Austal USA’s shipyard in Mobile, Alabama, USA on 24 June. This is the second vessel delivered by Austal USA to the U.S. Navy this month. Austal Chief Executive Officer David Singleton said the delivery of the latest EPF is further evidence of Austal USA’s success in efficient, modern shipbuilding and expertise in modular manufacturing. Three additional EPF remain under construction in Mobile as part of a 10-ship, US$1.6 billion block- buy contract from the U.S. Navy. The future USNS Yuma (EPF 8) will be christened later this (US) summer and will launch soon after, while modules for the City of Bismarck (EPF 9) are under construction in Austal’s module manufacturing facility (MMF). The first aluminium was cut for Burlington (EPF 10) earlier this month and module construction has begun in the MMF. U.S. Navy and High Speed Support Vessel (HSSV) for the Royal Navy of Oman. Austal also designs, constructs, integrates and maintains an extensive range of patrol and auxiliary vessels for government agencies globally, including the Cape Class Patrol Boat Program for Australian Border Force. Defence vessels are designed and constructed in Mobile, Alabama and in Henderson, Western Australia.